My encounter with music took place early, as I began to play the celtic harp at the age of seven. This musical education continued until the age of twenty in many music conservatory in Brittany. The contact with wood came later, after the A level, when I achieved a diploma of Arts and crafts at the Lycée des Métiers d’arts Du Guesclin in Auray (Britany). This combination of music playing and woodworking made me curious about instrument making, that is how I began a course in guitar making at Newark college in Newark-on-Trent in England. This course gave me the basis in guitar making, I learned with makers such as James Lister and Adrian Lucas. My curiosity was still there, more precisely about the theory that concerns instruments; it led me to the school of Markneukirchen in Germany which belongs to zwickau University of applied sciences. Combining the workshop practice, with makers such as Armin Gropp or Philipp Neumann and the theory, especially in acoustic and musical history. I improved my knowledge and my craft in guitar making. There, I also had work experiences, I spent a couple of month in the workshop of Jost von Huene in Dresden. 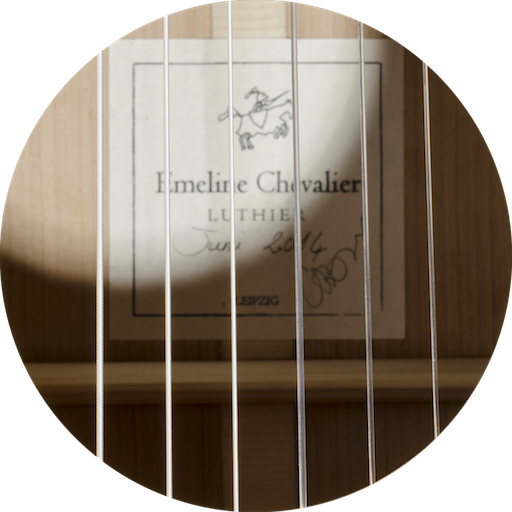 Whilst I was achieving the Bachelor of arts at the university I was preparing the diploma of Master of guitar making at the Chamber of handcrafts of Leipzig (Germany). My studies were succesful and I got a price for the best foreign student “DAAD-Preis” of zwickau university.